I am attempting something very brave this month, cooking and posting Vegan recipes all this month for the Vegan Month of Food where bloggers around the world will post vegan recipes all this month. Wish me luck dear readers as I do not fare very well with rules and schedules. the only other time I attempted to do something like this was when I joined Nupur in the blogging marathon. I was very rewarded although it was exhausting to post daily. Anyway, onto the recipe which is fairly simple. I like to add a dash of ready-made masala for a nice spice kick and lots of vegetables. A lot of people do not like to eat Vermicelli because it tends to have a sticky pasty consistency once cooked. This is due to the starch content in it. One way to combat this is to add a precise amount of water to cook it. Another way is to dry roast the vermicelli till golden to prevent it from turning mushy. I take the easy route out and buy pre roasted vermicelli. What? that’s 10 minutes off your active cooking time when you plan to make this! In a medium pan, heat the oil and splutter the mustard. Add the curry leaves and green chilli along with the onions and fry till translucent, add the grated ginger, the chopped vegetables and half the salt. Fry for 1-2 minutes. Add the pav bhaji masala (or garam masala) and fry for half a minute. Now add the hot water and taste for salt, adjust with the remaining, when the water comes to a boil, slowly add the vermicelli and stir till the water is above the vermicelli. Cover with a loose lid and cook for 5-6 minutes or till the water has been absorbed, but it is still moist. Turn off the heat and leave to rest for 5 minutes before fluffing with a fork and serving with some raitha and pickle. Many people hate the stickiness of vermicelli. Use the pre roasted version which is easily available to ensure it isn’t gooey and you dont waste time and gas roasting it. 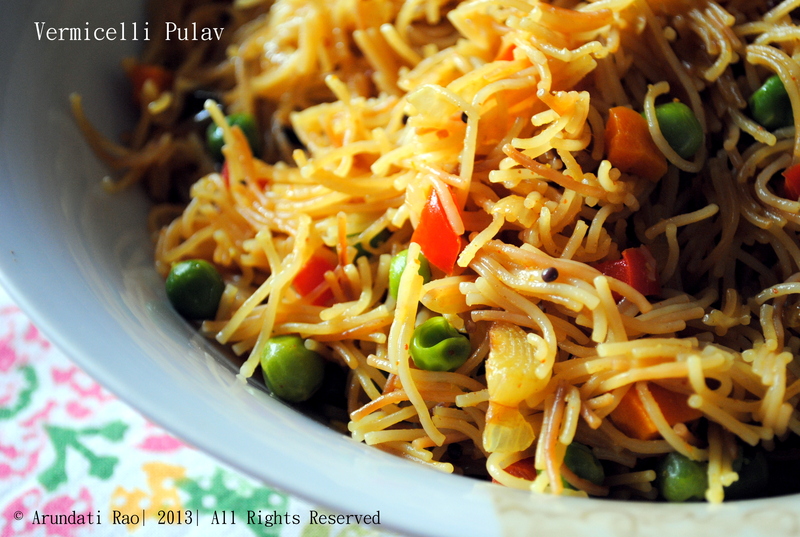 That pulav looks so good! I love the Anil brand. The semiya is so thin and fine.